We send care packages to deployed service men and women worldwide. Donations are appreciated and can be dropped off at the packing party or during sorting the day before between 5:00 pm – 8:00 pm. See below for other information and a suggestion list of items to send. We accept donations of items to send in the Care Packages, click picture below for our suggestion list. 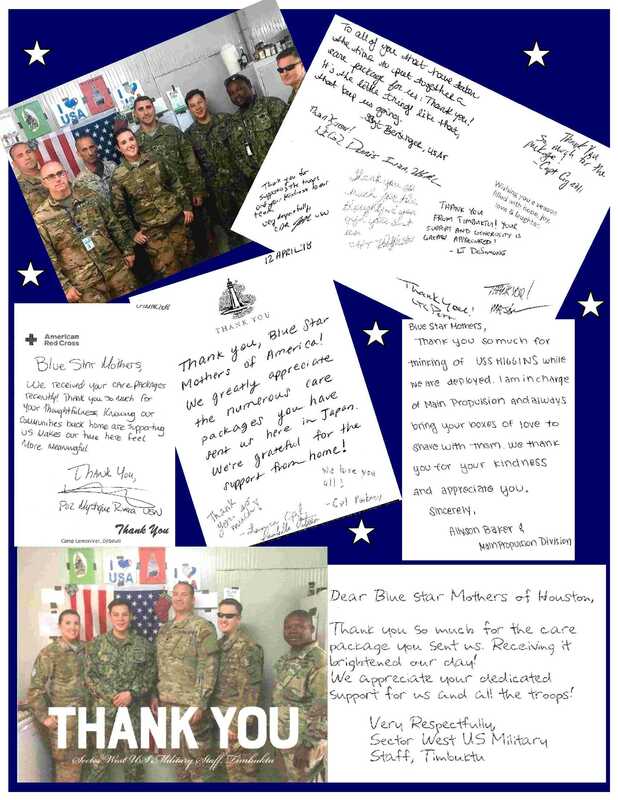 We can always use cards and letters to include in the care packages. Reference these guidelines and feel free to collect from your company, school, daycare, church, organization, etc. Bring to any packing party or meeting, see homepage for details. For large donations (boxes or more than 3 plastic bags), please email us so we can arrange to pick up those items. Scroll down for drop of locations of small amounts (1-3 plastic bags). We are more than happy to make arrangements to pick up any donation. We can make arrangements to meet you or pick up from your location. You can always bring them to any of our packing parties or meetings, see homepage for more details.